Australian aspirations in the Men’s Singles event at the Gold Coast 2018 Commonwealth Games came to an end on the early afternoon of Thursday 12th April; Heming Hu, always ready for the battle was beaten by India’s Sharath Kamal Achanta. The no.4 seed, Sharath Kamal Achanta emerged successful in five games (11-8, 12-10, 8-11, 11-6, 11-8). Heming Hu gave total commitment; he went for broke, chanced his arm and gave his worthy opponent more than food for thought, just as had Malaysia’s Javen Chong the previous evening in the second round. Sharath Kamal Achanta secured the first three games in style but the lost the next three eventually win in seven games (11-2, 11-5, 11-4, 7-11, 11-13, 6-11, 11-7). “Heming played some ridiculous shots; I thought I was playing Ma Long. Today was good but yesterday was a wake-up call. After winning the team event, all the interviews, I just took things too easy, I was down 4-7 in the seventh; I thought to myself lose and no more interviews! Sharath Kamal Achanta. Success for Sharath Kamal Achanta as quarter-final places beckoned, a round in which there was just one result that went contrary to seeding. England’s Paul Drinkhall, the no.5 seed, was beaten by the consistency of Eugene Wang, the no.14 seed (8-11, 11-7, 13-11, 8-11, 11-8, 11-4). Otherwise, matters advanced very much according to status with mixed fortunes for Nigeria. Quadri Aruna, the top seed, beat Singapore’s Pang Xue Jie, the no.11 seed (11-5, 8-11, 11-5, 11-5, 12-10) but after losing the opening game, a leg injury forced Segun Toriola, the no.12 seed, to withdraw from his contest against India’s Sathiyan Gnanasekaran, the no.2 seed. Progress for Sathiyan Gnanasekaran and Sharath Kamal Achanta, it was the same for colleague, Harmeet Desai, the no.7 seed, he ended the hopes of Malaysian qualifier, Chee Feng Leong (11-5, 11-7, 11-5, 7-11, 11-4). The end of the road for Chee Feng Leong, it was the same for his colleague Muhammad Ashraf Haiq Muhamad Rizal; he was beaten by Singapore’s ever reliable Gao Ning, the no.3 seed (11-3,11-5, 11-7, 11-7). Meanwhile, in the two remaining Men’s Singles quarter-final contests it was success for England. Liam Pitchfrord, the no.6 seed, accounted for Scotland’s Gavin Rumgay, the no.10 seed (11-6, 9-11, 11-1, 11-8, 11-2); Sam Walker, the no.8 seed, ended the hopes of Northern Ireland’s Paul McCreery (11-6, 11-8, 11-3, 11-4). 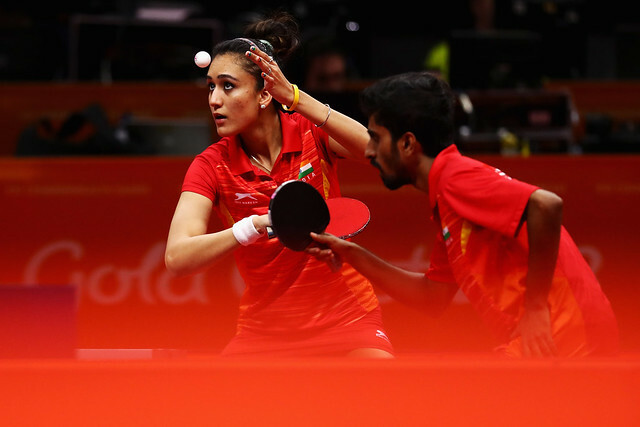 At the quarter-final stage Quadri Aruna meets Harmeet Desai, Lian Pitchford opposes Sharath Kamal Achanta; in the opposite half of the draw, it is Gao Ning versus Eugene Wang and Sam Walker in opposition to Sathiyan Gnanasekaran. The Men’s Singles quarter-final matches are scheduled for Friday 13th April.